A dome in reference to a traditional wood fired oven is the section of the oven which houses the fire. The fire sits upon the hearth and heats the surrounding dome walls. Due to thermal conductivity of the fire bricks or cob, the dome stores and radiates this heat back into the oven space termed the vault. 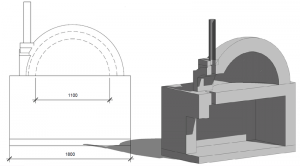 Thermal insulation below the hearth and surrounding the dome is low in thermal conductivity and thus prevents heat stored in the dome walls radiating out into the atmosphere.